In the US, the Federal Communications Commission must clear devices with hardware that can communicate with other devices or the internet – such as with the Vita’s 3G and Wi-Fi capabilities. Therefore, before a product is released, and when it is in the final stages of development, it must first be approved by the FCC. 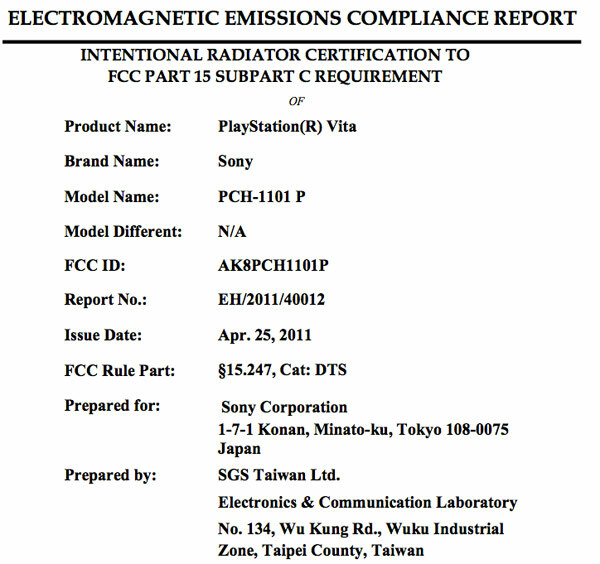 The PlayStation Vita has now been approved by the FCC, which means that the handheld has passed the final step before a consumer electronics device is shipped to retailers. That means that the Vita is pretty much ready to release in the US, adding to multiple rumors that it will have a fall release date. Of course, Sony still has to ensure that their supply chain is ready to support the demand for the Vita while keeping costs low. Additionally, the Vita’s launch software and Operating System will also need to be finalized, but one thing is for sure – the Vita has just got one step closer to release.